Another well-shaped polytunnel with good clearance at the sides, allowing full use of the floor area. 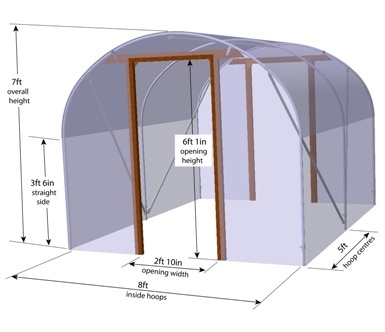 We use 25.4mm diameter high strength (Z35) galvanised steel tube for the framework of the polytunnel. A three-part hoop helps with easy transportation of the kit, assembled using swaged connections and a central ridge tube. A diagonal brace at each corner ensures stability of the structure. Timber end frames from 89 x 38mm tanalith treated timber for a long lifespan with a double-row of 38 x 19mm battens to secure the polythene. All fixings and fasteners are either galvanised or zinc plated and passivated for protection against corrosion.